Biscuits, (sigh), such buttery, flaky, goodness. 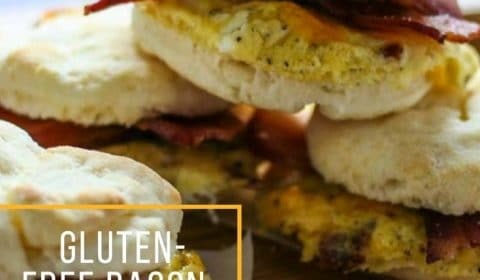 I think I found the jackpot with these gluten-free buttermilk biscuits. The kids even liked them! And you know what’s even better?? The fact that these little breakfast treats can be frozen and warmed up for the kids to grab on-th-go during the week. Win-win for mom! I’ll admit, I am not the mom that gets up and fixes the kids a nice, hot breakfast before school. No mom shaming here, if you’re that mom, too, no worries! I’ve got the solution right here. Just make a batch of these on Sunday, wrap up with plastic wrap, and pop into the freezer. Voila! 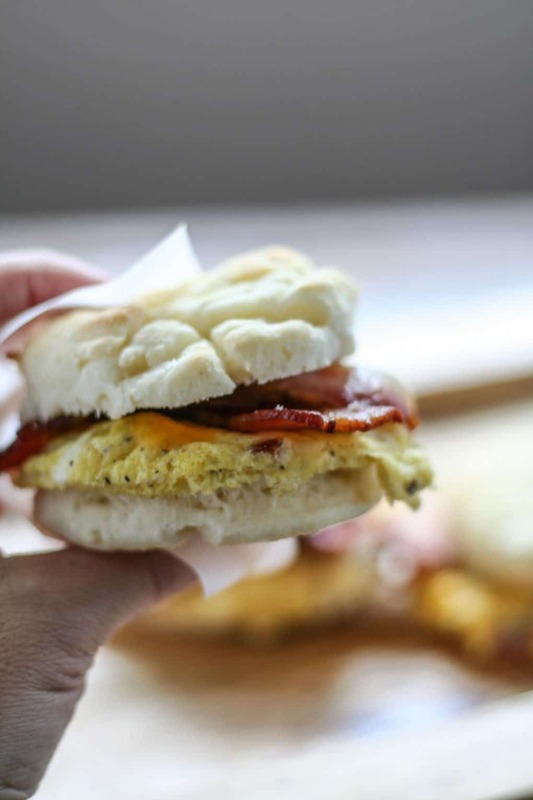 You’ve got a hot breakfast for the kids that’s just as good as McDonald’s. Seriously, they’re really good. In the words of my teenagers, “These are really good!” So there’s that…bonus points for mom! Preheat the oven to 450 degrees F for the biscuits. Combine the dry biscuit ingredients in a large bowl and mix together. Cut in the butter using a fork or pastry cutter until the butter is about pea size. Slowly pour in the buttermilk and stir until you get a nice dough. Lightly dust your table or counter with the gluten-free flour and place your dough onto the table. I choose not to roll out the dough, but instead use my fingers to flatten out the dough until it’s about 1/2 in. thick. Using a round biscuit ring, or mason jar lid ring, cut out your biscuits and place onto a lined baking sheet. Continue process until you’ve used up all of the dough. Cook for 10 minutes or until light golden brown on top. 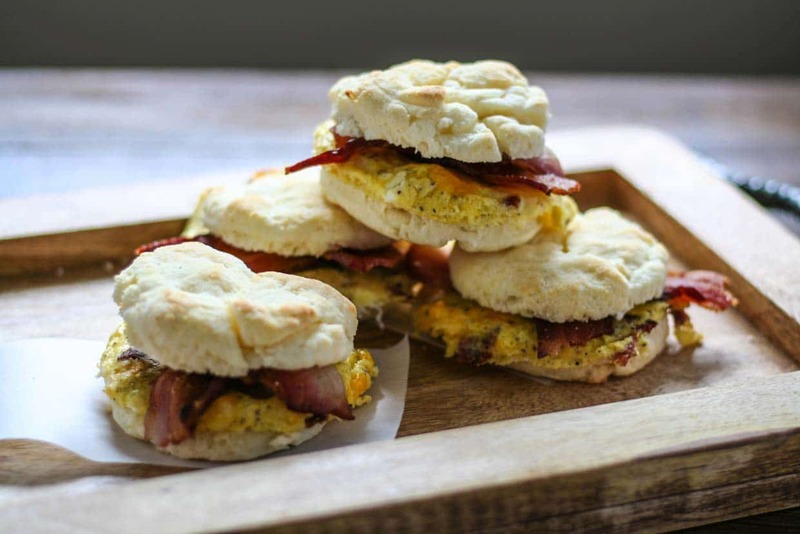 While the biscuits are cooking, start your bacon and cook until done. Remove from pan and set aside. In a small bowl, combine egg ingredients and whisk together until well combined. Using the bacon grease already in the pan, pour the whisked egg mixture into the pan. You’re going to cook this like a frittata. Shake the skillet, once the bottom is cooked and the top is still loose, place into the oven and turn to broil. Watch this carefully. Once the egg mixture is cooked on top, carefully remove from oven. Using the same biscuit ring, cut out egg for the biscuit. Or, cut into small squares. Assemble biscuit by cutting the biscuit in half. 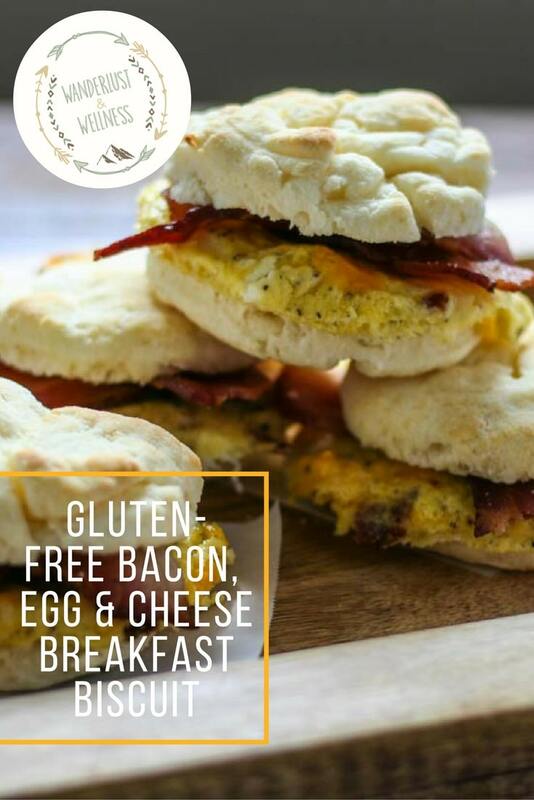 Place egg, then bacon onto the bottom half of the biscuit, then place the top half on top. If not serving immediately, let cool, then wrap in plastic wrap and place into the freezer.